How to Kick Overwhelm to the Curb Once and For All! The theme for my main blog posts the past couple of weeks has been about overwhelm in one way or another. I’ve written about a few things you can do to avoid it, how to get out of it once you’re in it, and even danced around one of the the best ways a business owner can avoid and stay out of overwhelm. So today, I’m going to jump right in and state the obvious. Overwhelmed? Stop trying to do it all yourself. 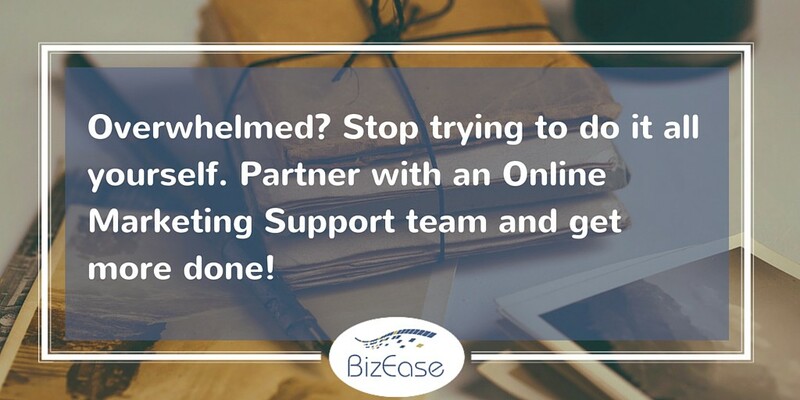 Partner with an online marketing support team and get more done. I know … you say “you have to say that because it’s what you do!” Well yeah it is, but it’s the truth. One of the biggest issues we (and yes, I said we) small business owners deal with on a day to day basis is trying to avoid and stay out of overwhelm. Which is why I do what I do. Overwhelmed? Stop trying to do it all yourself. Partner with a marketing support specialist and get more done. So stop beating yourself over the head because you’re frustrated and overwhelmed because you’re trying to do it all yourself. Take the plunge and partner with an online marketing support team. Find the marketing support specialist or team that fits your business and gives you that “ahhh” feeling of relief because you know you’re in good hands and can actually relax for a minute or two. Or heck …maybe even take a day or two off to have some fun with friends or family ;) Here’s where you might want to stop back by and review the article on how to work effectively with a team of Marketing Support Specialists. If you have any questions or want to know more about working with an online marketing support team … just let me know! Originally published at BizEase Support Solutions.